Join Top Social CIO at the First #CIOChatLive! 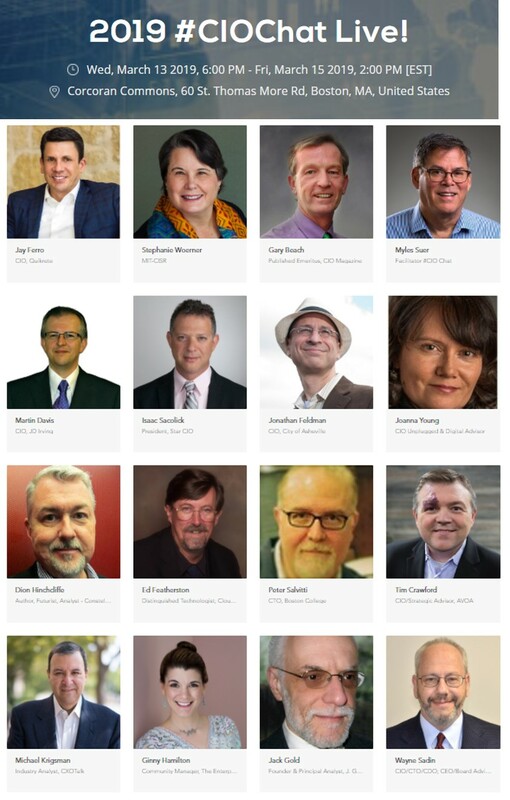 If you're a CIO, CISO, or CTO and want to connect with the brightest, most socially vocal group of CIOs then please join us for the first ever #CIOChatLive in Boston on March 14-15th! If you are not familiar with #CIOChat, it's a twice per week gathering on Twitter that you can follow with this hashtag. On Thursday at 2pm ET, moderator Myles Suer sends out 4-5 questions around a topic while the Saturday, 10:30am chat is around a single theme. In fact, some of these chats have been inspirations for my posts. See the one on 12 warning signs of bad application architecture and on killing legacy IT steering meetings (which many #CIOChat members loathe) and replacing it with a Driver's Voice meeting. Those of you following my writing already know that developing relationships, learning outside-in, and getting out of the office are part of my new year's resolutions for CIO and digital transformation leaders. If you can get out of the office, then please join us at the event! If you can't, then come join us on Twitter at one of our #CIOChat sessions! Participants include #CIOChar regulars include Jay Ferro, Myles Suer, Martin Davis, Isaac Sacolick, Jonathan Feldman, Joanna Young, Dion Hinchcliffe, Ed Featherston, Peter Salvitti, Tim Crawford, Jack Gold, and Wayne Sadin. You'll also get to hear from experts including Stephanie Woerner (MIT-CISR), Gary Beach (emeritus of CIO), Michael Krigsman (CXOTalk), and Ginny Hamilton (4Enterprises). The agenda covers a wide range of CIO/CTO/CISO concerns including digital transformation, innovation, change management, agile, devops, risk management, diversity, and data/analytics.